Hell’s Kitchen used to be a no-go zone. It was a gritty section of New York City with dangerous gang warfare and violent streets. Although West Side Story does not have any specific references (aside from its title), the plot, which was based on fractured race relations, was the story of Hell’s Kitchen pre-1990s–minus all the singing and dancing. But Tyler Whitman, a Triplemint broker and a proud Hell’s Kitchen resident, says there is actually quite a bit of singing that still goes on today. The ‘hood retains some grit, in a charming New York way, but it is a genuine residential neighborhood in the midst of big changes, as new buildings and businesses spring up every day. But unlike a lot of other up-and-coming neighborhoods, Hell’s Kitchen has flown rather under the radar, with many New Yorkers still believing it’s an extension of Midtown or a stopover spot for dinner. Ahead, we break down why those in the know are moving to Hell’s Kitchen and all the amenities it has to offer for people to stay awhile. At the crossroads of Fort Greene, Downtown Brooklyn, and the BAM Cultural District, The Ashland rises. Next Tuesday, July 19, the 53-story, 586-unit tower will open its leasing office to prospective renters interested in its one-, two- and three-bedroom no-fee apartments, priced from $2,600/month for studios to $7,500/month for three-bedrooms. Previously, 282 apartments went online through the city’s affordable housing lottery. 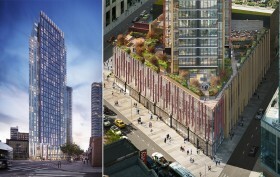 To coincide with the grand opening, the Gotham Organization-developed and managed building has also launched its full website, providing us a bundle of new renderings of the exterior, the apartments, and the 17,000-square-foot marketplace that will open along its ground floor.